Aleatoric Fair Isle is A KNITSONIK/tomofholland art project to be realised by Felicity Ford and Tom van Deijnen between Spring 2013 and Shetland Wool Week using gorgeous Jamieson and Smith yarn in a huge variety of shades! 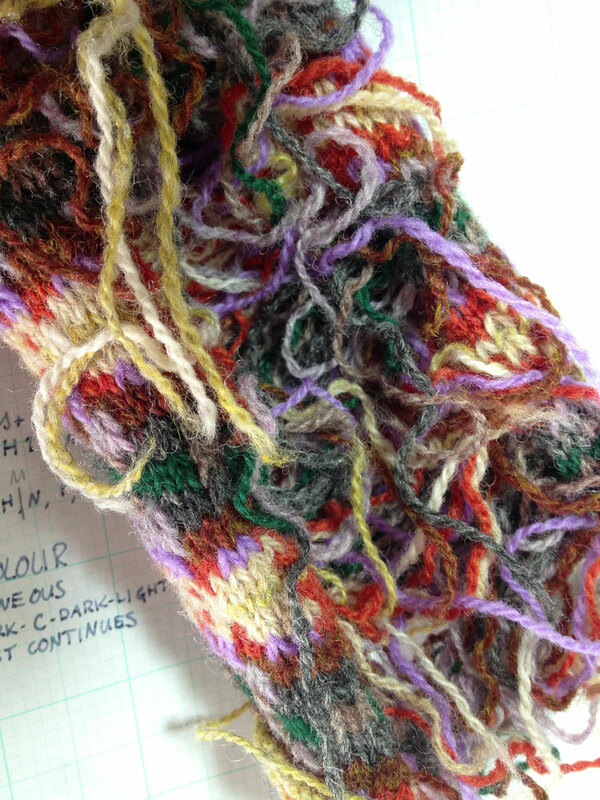 Followers of thedomesticsoundscape and tomofholland will know that we like mixing our knitting with sounds, literature, wool-appreciation and archival or collecting practices! We first met at a launch in Prick Your Finger where I was exhibiting “The Reading Gloves”, a collection of hand-knitted gloves portraying literary figures like Lady Chatterley and Dorian Gray. In our second meeting, (also at Prick Your Finger) Felicity was making “KNITSONIK 01” – a podcast about the sonic world of knitters. Considering our mutual interest in the auditory, the literary, all things woollen, and making our own archives and libraries, it should come as little surprise that we have invented a new project for Shetland Wool Week that combines all these elements! This project is “Aleatoric Fair Isle” and anyone who follows us on instagram will already have seen some tasty glimpses of the outcomes. But wait a second: what is this “Aleatoric” when it’s at home? In musical terms, aleatoric music is “music in which some element of the composition is left to chance”. There are several examples of knitters appropriating aleatoric processes in order that some knitted compositions leave an element to chance – an aleatoric pattern generator; a child’s sweater in which the cables are all determined by die rolls; and I bet some of you have found similar projects! However what we have become specifically interested in for “Aleatoric Fair Isle” is finding ways of using dice to liberate us in our explorations of Fair Isle knitting and remove some of our anxiety over colour choices, pattern placement etc. which we have found can impede the pleasure of experimenting. Although this may not be true in Shetland, in the prim South of England where we are based, many knitters – including us – seem mildly afraid of designing stranded colourwork! Informal chats with knitbuddies reveal fears of choosing colours that don’t work well together, of making something ugly or un-wearable, and ultimately, of wasting time or yarn on making things that are unpleasing. In our own experiments, we have found we veer towards using the same safe and familiar palettes and patterns, rather than venturing forth with boldness! This seems a shame when the Jamieson & Smith shade card offers such an infinite variety of daring possibilities to the adventurous knitter, and when examples from the Shetland Textile Museum convey such a wealth of incredible possibilities. 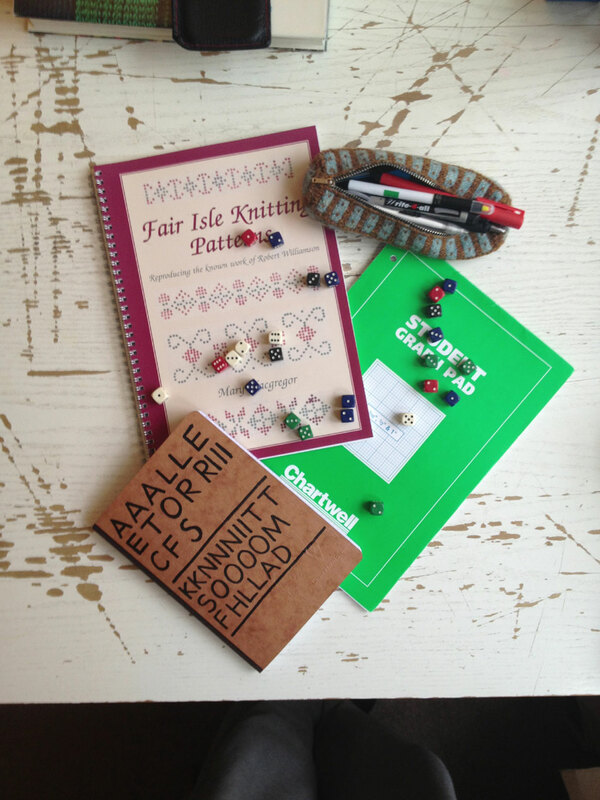 To combat our fear of failure, to challenge our own ingrained tendencies, and to find a way of approaching the inspiring world of Fair Isle knitting, we have devised a system for remixing Fair Isle patterns based on both observing some principles of colour theory, and leaving many of our decisions to the roll of a dice. Our experiment is loosely based on one aleatoric musical composition by John Cage – “Apartment House 1776” – Apartment House 1776 was composed to coincide with the bicentennial celebrations of American Independence, and is meant to evoke the sense of sticking your head out of the window of an apartment in 1776, and hearing drifts of music from the instruments and composers of that time appearing in snatches and snippets on the wind. Charlton Lee comments in a review,” one can still recognize that the music comes from the language of the 18th century, but often the harmonic function is destroyed, morphing the result into a bright and fresh new gesture. When a cadence has been lost, two separate phrases seem to blend into one longer thread”. As in Cage’s composition, we like the idea that you could stick your hand into our eventual pile of samples and have a similar sense to Cage’s audiences; that of finding something recognisably “Fair Isle” but also reworked into something new, and fresh. We are using Mary McGregor’s amazing book “Fair Isle Knitting Patterns: Reproducing the Known Work of Robert Williamson” as our source text. This book details the knitting patterns noted by Robert Williamson, 1885 – 1954, spotted in Shetland, which we are reworking in 21 shades of Jamieson & Smith yarn. 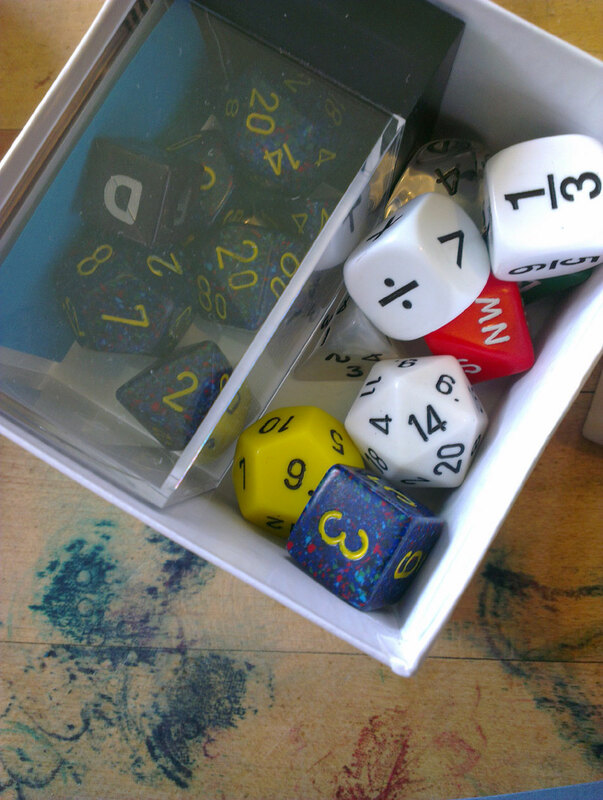 Our creative experiment, “Aleatoric Fair Isle”, will result in the creation of a great number of Fair Isle swatches derived from dice rolls to determine patterns used, and yarn-shades chosen at random. In homage to Cage (who was a great appreciator of everyday sounds) the sounds we hear whilst knitting each of the swatches will be carefully documented. Our respective discoveries and process will be shared on our different blogs (Felicity’s blog can be found here), twitter (@knitsonik, @tomofholland), facebook, and instagram (@felixbadanimal, @tomofholland), and where all relevant photos will be hash-tagged #AleatoricFairIsle, but the full experiment and its workings will only be completely unleashed in its full glory at Shetland Wool Week! 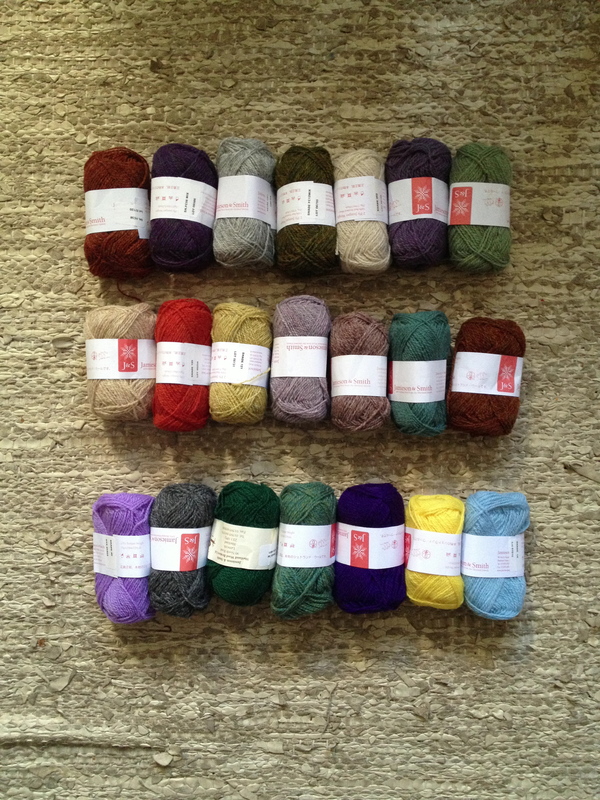 So far we have knit a couple of swatches and it has been extremely fun to put our ideas into practice. We have ended up using colours which we would never have thought to combine, in patterns which we may not otherwise have chosen, which is exactly the point of our experiment! All the images used in this post first appeared in the instagram feeds of @tomofholland or @felixbadanimal! This looks really exciting, can’t wait to see some of the results! lovely! I often start knitting without any clear pattern – I have one scarf/shawl on the go now where I knit until the ball of wool runs out and then go buy another (of the same wool.) The colours are determined by what is in stock when I go to the store. I started this project in the UK and am continuing it in Canada. That sounds like a great way to get colours together. I still remember your scarf you were knitting at MendRS Symposium. If I remember correctly you knitted stripes and chose colours depending on where you had been for beach cleaning and how much time you spent doing it? 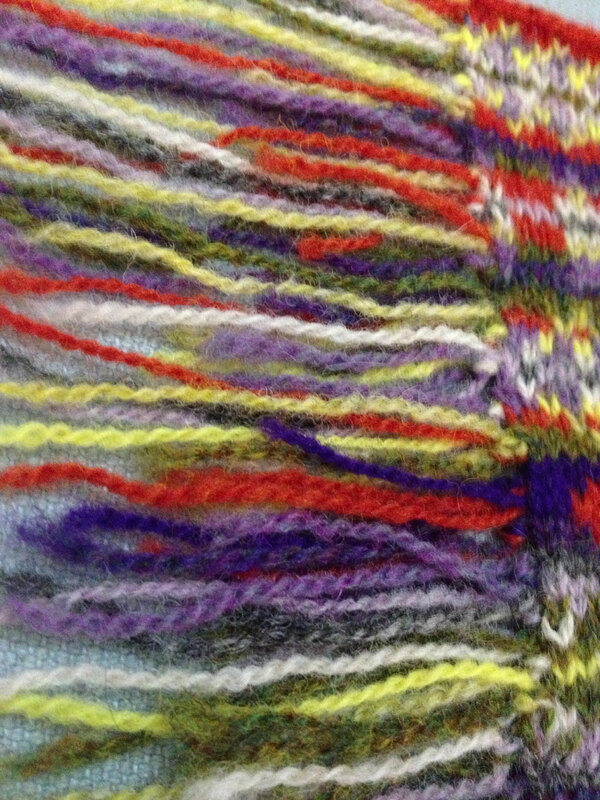 I look forward to seeing your creations in Shetland later in the year. Happy knitting, this is an interesting work. The 21 shades look bright and cheerful so I am sure the swatches will not be dull! I’m really excited to visit Shetland for the first time! I’m really looking forward to seeing how our experiment will develop, and I hope to learn more about colour and pattern through this process. It’ll be great to present it at Wool Week. Tom I have a lovely little book called “A Shetland Pattern Book” given to me by an elderly neighbour who was clearing out her sisters things. Anyway, while I like looking at it, I know I am not actually going to knit anything from it so I’d like to send it to you – e-mail your address to shop@ecozee.co.uk if you’d like it.